(Minghui.org) Evidence of the Chinese Communist Party’s involvement in harvesting organs from living prisoners of conscience was first disclosed in 2006. Although the international community has condemned this atrocity, China is still considered one of the world’s top transplant tourism destinations. The following are a few of the many suspicious organ transplant surgeries that were performed at the Huaxi Hospital in Sichuan Province, China after 2006. The Chengdu Business Daily in China earlier this month carried a series of articles on the plight of Liu Shengping, a music teacher at Chengdu College of Arts and Science. He was diagnosed with cirrhosis of the liver and had waited in a local hospital for nearly 60 days for a liver transplant. However, when doctors made two livers available to him, on two separate occasions, he was unable to come up with the requisite 300,000 yuan (about $48,000 US) to cover the costs of his liver transplantation. When news of his heartfelt story began to go viral, donations started to pour in. On June 3, 2015 a donor liver had suddenly become available, and a successful liver transplantation was performed on the morning of June 4. The Chengdu Business Daily did not bother to mention the source of the first two livers, nor how it was possible that all three livers had mysteriously become available within a short two-month period. The article did not mention the doctor’s name or his position at the hospital, nor did it give any details about the donor, such as his name and occupation; the time of his stroke and eventual death; the time of the transplant operation; how the hospital had been able to quickly ascertain that the donor was a perfect match for Mr. Lui; the procedure that the hospital followed to ensure that the donor had indeed willingly donated his organs to humanity, and whether he was conscious when he arrived at the hospital. The Tianfu Morning newspaper reported on a three-day liver transplantation that had involved eight professors and eight nurses at the Huaxi Liver Transplant Center in Huaxi Hospital, from September 12 to 14, 2006. The first transplant of its kind had been performed there in 2005, and had been hailed a complete success. Huang Fuyu volunteered to donate a portion of her liver to her husband, Lan Siquan, who had been suffering from an acute case of cirrhosis of the liver. The couple had entered Huaxi Hospital on September 5, 2006. However, when doctors reviewed the results of Huang’s physical exam on September 10, they concluded that although her liver was very healthy, it was small. Thus, removing too much of it from her body would likely put her life at risk. The article failed to address the unlikelihood of the hospital finding a suitable, healthy volunteer donor within such a short span of time; nor did it provide any pertinent information about the donor, such as his name, place of residence, and cause of death. It makes one wonder if this “volunteer” donor had actually come from a large organ bank of people who are being systematically killed in order to fuel China’s international organ trade. The patient, 38-year-old Huang Yisheng, had been employed at a Shannxi City coal mine for 17 years. One day in December 2006, he collapsed while working and was taken to a local hospital. Several doctors diagnosed him with severe pulmonary fibrosis and pneumoconiosis, or black lung disease—caused by inhaling excessive amounts of coal dust. When the journalist asked for the name of the surgeon who had performed Huang’s organ transplantation, the doctor became very evasive. The article also mentioned that all of the transplantation surgeons at Huaxi Hospital were taught how to perform surgery on animals. So when did these Chinese surgeons first begin to perform human organ transplants, and how long have they been performing experimental human lung transplants? The article did note that another hospital in China had previously performed a successful half-lung transplantation, but it did not mention if this same type of transplantation had been carried out at Huaxi Hospital. However, if China’s first whole-lung transplantation was indeed performed at Huaxi Hospital—as the article claims it was—then why wasn’t there any mention of any half-lung transplants being performed there? How did the main transplantation surgeon, Liu Lunxu, manage to successfully perform a whole-lung transplantation without prior experience in half-lung transplants? Is it possible that the hospital is covering up the fact that it has been performing half-lung transplants, and possibly whole-lung transplants, for quite some time now? From the doctor’s own words, one can easily see that the source of the hospital’s organs is questionable, at best. Also, a hospital would not advertise its lung-transplantation services if its surgeons’ skills and techniques were not up to par. That being so, it is likely that Huaxi Hospital has been secretly performing whole-lung transplants for many years now. Assuming that these figures are correct, is it possible that at least some of those 140 livers had come from Falun Gong practitioners, who are being routinely persecuted by the Chinese regime for their faith? A lot of hard evidence indicates that this may be so. 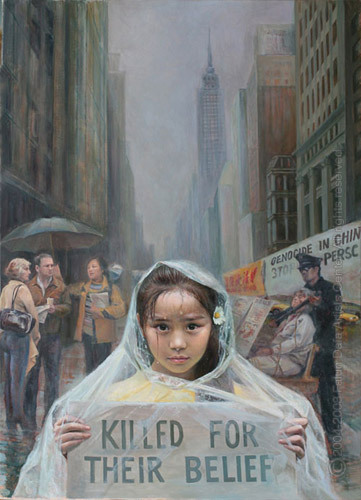 (Minghui.org) The Chinese Communist Party’s (CCP) harvesting of organs from living Falun Gong practitioners shocked the international community when it became known in 2006 and has been condemned ever since. Recently, the United State Congress held a hearing on the CCP’s harvesting of organs from political dissidents and religious believers. At the United National Human Rights Council meeting, international organizations proposed to conduct an immediate investigation into the CCP’s live organ harvesting. This development drew people’s attention to this issue again. Doctors, lawyers, judges, elected officials, movie directors, and the public strongly condemn the CCP’s reprehensible practice and call for an end to the atrocity. On September 26, 2012, Doctors against Forced Organ Harvesting (DAFOH), an organization made up of doctors from several countries, handed over a petition with 23,000 signatures to Susan Rice, US representative to the UN, at UN Headquarters in New York. DAFOH called on the US government to exert pressure on the Chinese Communist regime to stop the forced organ harvesting. The appeal also called on the US to release information on live organ harvesting that Wang Lijun, former head of Chongqing Police Bureau, submitted to the US Consulate in Chongqing when he went there to seek asylum. Dr. Wen-Je Ko, former head of the Organ Transplant Group and Director of the Trauma Management Department at the hospital of National Taiwan University, asked the Taiwanese government to address the issue of patients going to mainland China for organ transplantation in order to have them avoid becoming accomplices in the CCP’s organ trafficking. Teresa Chu, the spokesperson for the Taiwan Falun Gong Human Rights Lawyer Team, was recently interviewed by senior reporter Yang Hsien-hung of Taiwan Central Radio Broadcasting Station. Ms. Chu stressed in the interview that the Chinese Communists have been harvesting human organs from living people for a decade. Not only is it murder, it is also a crime against humanity. She called for global exposure of the outrage, and the promotion of legislation to stop it. The Taiwan International Organ Transplant Care Association recently held a seminar “Exposing the CCP Atrocity of Live Organ Harvesting” in a community in Kaohsiung. Many audience members indicated after hearing the report that even if a family member needed an organ transplant, they would not accept an organ of unknown origin, because one should not take the risk of sacrificing another’s life in exchange for extending one’s own. Ms. Huang said she would tell her friends to read the book Bloody Harvest. Mr. Ma, a member of the community’s management committee, commented that the risk of rejection with a non-relative’s organ is very high. Kidney dialysis can help for a while, but getting a kidney from a non-relative can hasten death. Mr. Ma said, “Today’s video will make me think about it for a long time. I really cannot accept something so cruel. If live organ harvesting is true, it is terrible!” He knew that a lot of medical practices carried out by the Chinese communists are irresponsible. Injection of large doses of anti-rejection drugs is a great risk, not to mention the many brutal killings behind the scenes. He called on the people of Taiwan to not be hasty about going to the mainland for an organ transplant.